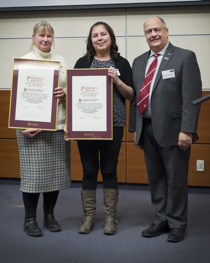 Dr. Lisa Rankin of Memorial University’s Archaeology Department and Rigolet AngajukKâk, Jack Shiwak, received the university’s President’s Award for Public Engagement Partnerships December 16, 2016. The award was for the Inuit community-led archeological dig at Double Mer Point, just a few kilometres outside of Rigolet. Rankin has been doing her archaeological work near Rigolet as part of the Tradition & Transition Research Partnership, which is made possible with funding from the Social Science and Humanities Research Council of Canada. In 2013 the Rigolet Inuit Community Government approached Dr. Rankin who was wrapping up an archaeological project on the South Coast of Labrador to see if there would be any interest in developing the archaeological site just outside the community at Double Mer Point. A partnership was formed which would see Dr. Rankin and her students coming to Rigolet each summer to excavate three traditional Inuit sod winter homes. Even though the archaeological dig is not supposed to finish up until this summer, the site has already become a hot spot for curious tourists and locals alike. As community members come to look at what the archaeological team has found, they help to identify objects the team has unearthed. Rankin and her team always make a point of hiring local summer students as well. Rigolet has just finished construction of North America’s longest wooden boardwalk with the community on one end and the archaeological site on the other. The community of just over 300 people beat out the metropolis of Atlantic City, NJ which was the previous record holder. Their goal was to develop the Double Mer Point site as a destination at the end of the boardwalk for tourists passing through in the summers. To learn more about the Double Mer Point Archaeological Project, check out the APTN Series Wild Archaeology (http://aptn.ca/wildarchaeology/episode-guide/) which features two episodes on the dig site.